Medusa: A STAR IS BORN: SUSAN BOYLE !!! 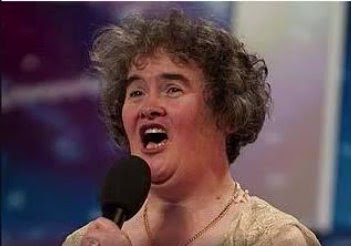 A STAR IS BORN: SUSAN BOYLE !!! What an incredible voice. Living proof not to judge a book by it's cover! You're so right, AuntieBon. You can't judge a book by its cover. Susan's voice is unbelievable, and she's adorable, to boot. I'm so happy she brought the house down. I hope she has years and years of success in her future. It couldn't happen to a more delightful and deserving person. OMG! Thanks so much for sharing this video. I had no idea this show even existed. Her voice is soooo beautiful!! Pooti! So great to hear from you. Just read your blog post. Great job! And thanks so much for the shout-out. Really appreciate it. The looks on the audience's faces prior to her performance made me so irritated. I am really glad she got up there and proved them wrong. I've been hooked on this video since yesterday. I can't stop watching. She's absolutely incredible!! She brought tears to my eyes. The look on the judges' faces and Simon's happy sigh (around 4:01) says it all. Susan Boyle is an inspiration to us all! I was so upset to see people laughing at her before they even saw her act, although admittedly with the way these reality TV shows build acts up, I was expecting some bad rendition of 'I've Got A Lovely Bunch Of Coconuts'. How VERY wrong we all were! I don't know if you've been following any more of BGT but I'd check out Hollie Steel if you haven't already. She's a lovely little girl and could even give Susan a run for her money!